This level has medium difficulty and you need to use good technique to complete this level. 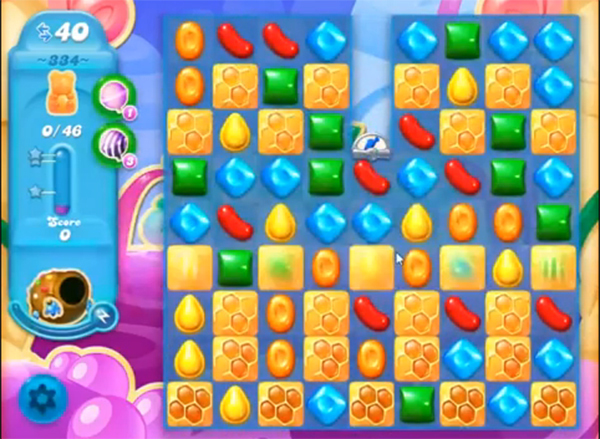 For this level you should try to play from middle part of the board where you have more candies and try to make special candies or combine special candies to each other to break honey blockers to save the bears. Try to use colorbomb with striped candy or striped candy with wrapped candy to break more honey blockers to save all bears within 40 moves. I can’t get through this level, been at it a long time. Soon giving up this game even though I love it!! Agree with you on this one Linda. Been struggling for perhaps more than a month now. Wonder if this is the last one. I can’t get passed this level. I quit playing for a year. I thought I give it another try, still can’t get passed. I’m about to quit for good. I agree with the above, it has been over a month and can’t get past this level. It isn’t fun anymore. I agree with the above. It has been over a month for me too and it isn’t fun anymore.